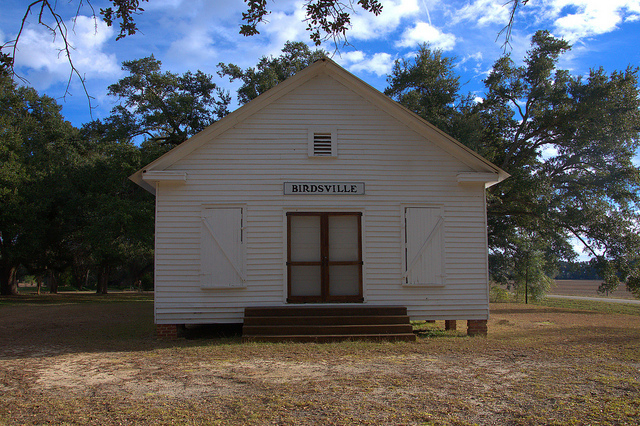 Birdsville Plantation has been owned by the Jones family since the mid-1700s and is one of just a few well-documented 18th-century residential structures still standing in the interior of Georgia. Modifications giving the house its present appearance were made circa 1847. Somehow, it was miraculously spared by Sherman on his March to the Sea. Mary F. Andrew clarifies the history: For the record*, this was not the home of Francis Jones. F Jones settled south of Rocky Ford. His son, Philip, most likely built the older part. He acquired the land in 1785 for his services in the Revolutionary War. He died in 1789. His son, Henry Philip Jones, is responsible for the front addition seen in the picture. See Bell-Parker above. I have researched it as thoroughly as I can and know this to be accurate. 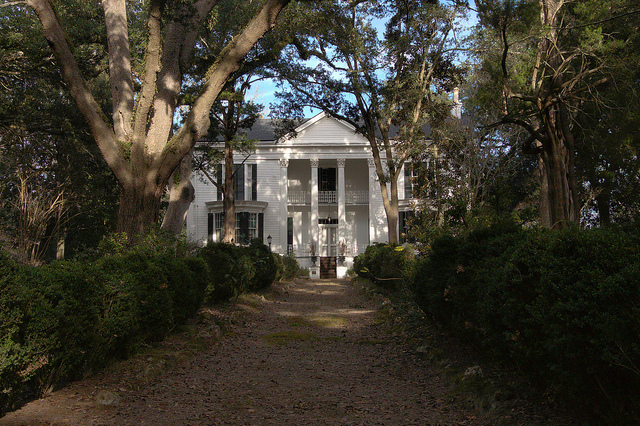 HPJones’ youngest son, Wm B Jones, lived there during the Civil War. The twins were his. Gen. Sherman stayed briefly at the magnificent home of his brother, Jos. Bertram Jones, near Herndon. Unfortunately, JBJones’ home, which was visited by many important people of the day (latter half of the 19th century) and the site of much social activity, burned in the early 1900’s. *I was initially of the impression that this was first the home of Francis Jones. I’m grateful for Mary F. Andrew’s research and for her sharing it here. This is the old Birdsville commissary, which served the plantation for many years. 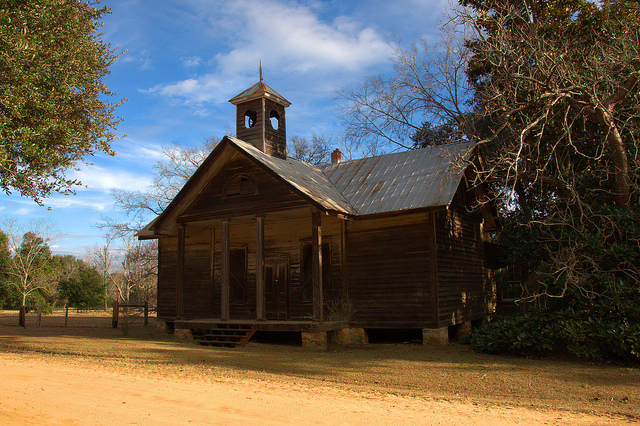 I would guess that it served as a schoolhouse or chapel at one time. 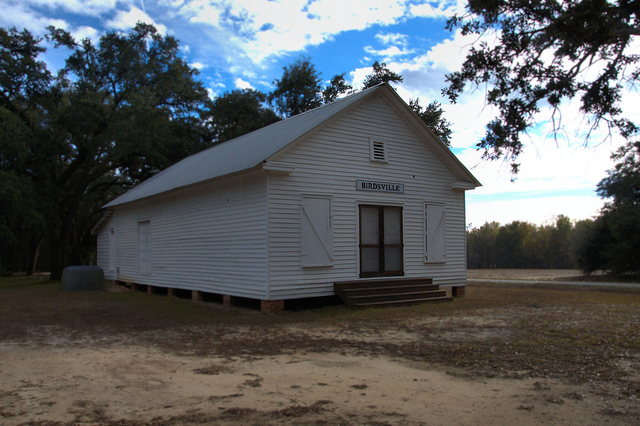 The entire plantation and all structures located thereon are on private property. I’m grateful to have been given permission to photograph and greatly enjoyed my brief visit there. Bill Hozey recently wrote: I lived in the newer house just down the lane from the main house as a child. I have spent many a day in the Franklin house and with the family. I remember vividly the human skull in the basement and was told by the Franklins about Sherman sparing the house due to the death of the twins. Mrs. Grizzard lived in the old Post Office during this time. She was the piano teacher at the private school, Buckhead Academy. This general store once served the Birdsville area. It’s privately owned. Birdsville was named for postmaster Samuel Bird.